Neighborhood Revitalization Zones were created by the Connecticut Legislature in 1995 (Public Act 95-340) to revitalize neighborhoods through the collaborative involvement of residents, businesses, non-profits and government to determine the vision and priorities of the individual neighborhoods. Few cities have a neighborhood with the State Capitol at one end, and the City Hall at the other, a beautiful city park - one of the country's oldest - an art museum, and a renowned performing arts center. 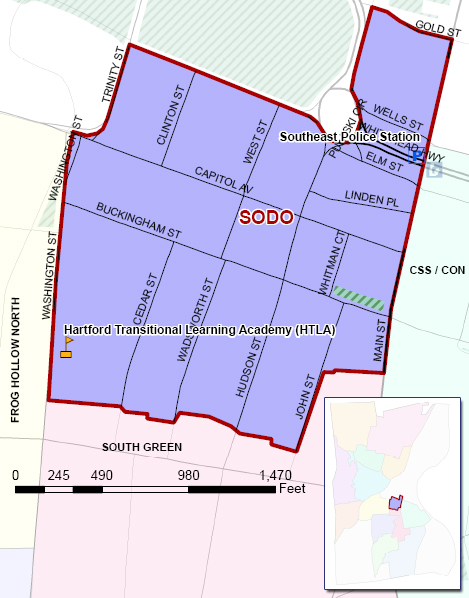 Hartford's South Downtown ("SoDo") neighborhood contains all of these. The area also includes some interesting neighbors: The State of Connecticut is the largest land owner and a major employer. The Bushnell Center for the Performing Arts is one of the city's greatest assets, and it's right here in South Downtown. The neighborhood feels fortunate to have the Center as a neighbor, and recognizes the importance of working together with it on our mutual goals. The last key participants in the neighborhood are the residents and other stakeholders, who are actively involved in shaping a vision for the future of South Downtown. While the population is comparatively less than most of the other neighborhoods in Hartford, there may be a larger percentage of participants in the NRZ process in this neighborhood. SoDo runs on the West side of Main Street from Gold Street, south to the northern property line of the parcels on the north side of Park Street, west to Washington and Trinity Streets and along the south (Elm Street) and East (Pulaski Circle and Wells Street) sides of Bushnell Park. That description is easier if you are looking at a map (enlarge for best view). The SoDo NRZ meets monthly. For more information, visit our Hartford 2000 website or email us. Sign up for our newsletter, and check out our Facebook Page, our NextDoor Page, and our Group on LinkedIn. Copyright 2016 SoDo NRZ. Like us on Facebook. Follow us on LinkedIn.